If intelligence and beauty are important to you, The American Eskimo dog can deliver. These fur babies, often affectionately referred to as Eskies are alert, trainable, loyal, and friendly. Could you ask for any more in a dog? Eskies love to play and run around, but they also love to snuggle and protect their owner(s). Despite looking like a miniature Samoyed, the American Eskimo Dog is not a Nordic-type dog but does share some of the same features as one. They have a stunning coat of hair, and distinct features on their face such as black lips, nose, and rim of their eyes. The Eskie comes in three different sizes, much like the Poodle. These include a toy, miniature, and standard. There are not many variations of these pups’ coats or color, but each Eskie has their own unique personality even if they all look similar. The toy American Eskimo Dogs are a perfect size, weighing in at less than 10-pounds, which makes them the ideal lap dog and snuggle buddy. This breed has many unique characteristics and sides to them, which make them very adaptable and suitable for a wide range of people. If you’re looking for a versatile dog that is also highly intelligent, energetic, and loyal, then the American Eskimo Dog may be the perfect match and your new best friend. Although they do look very similar to other Nordic-types, they do not share the desire to be sled dogs. These guys are very closely related to the German Spitz, and despite their name, Eskies are neither American nor do they have anything to do with the Eskimo culture. They originated in Germany and were brought to America by European immigrants. Once they arrived in America during the 19th century, the American Eskimo Dog worked in circuses, walking on tightropes. Circuses liked to utilize and highlight their agility, and they would even sell them to members of the audience, which was very controversial. The Eskie was originally bred as a companion dog; however, they were also bred to guard people and property, making them excellent guard dogs. They are also very territorial but are not considered an aggressive breed. This particular breed is very loyal to their owners and follows in their footsteps, literally, making them the perfect shadow. Because they are very territorial, Eskies have the tendency to be vocal when a stranger comes around their owner or their owner’s property. This breed is definitely smart and easily trainable, but they stay in their puppy stage for longer than almost any breed. They take a while to mature and can carry puppy traits up until they are 2 years old, which is a year more than most breeds of dog. They can suffer from severe separation anxiety or other misbehavior if they do not get the proper training from day one. They need to be socialized with children, pets, and other people if you want them to be on their best behavior around strangers. Since they are intelligent and easily trainable, they pick up on new behaviors and tricks extremely quick and rank in the top breeds for agility competitions. 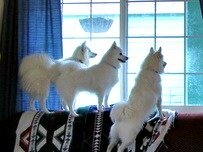 Eskies love to please but need to be in an environment with a firm, confident, and consistent pack leader. Without this, they might think that they are the leader of the house, which can lead to behavior issues such as excessive barking, unnecessary aggression, etc. They need a right amount of both mental and physical exercise, or they can become frantic and high-strung which could cause them to excessively spin in circles. Suffering from Small Dog Syndrome is a real possibility for this breed. Because they are small and cute, owners can tend to ignore the wrong behaviors, which can end up bad for the both of them in the long run. They need daily exercise to help them release pent-up energy since they are such energetic dogs. Being a very versatile breed, they can live almost anywhere from a large house to a small apartment. They just like to be near their owner at all times. If you’re considering this breed and have babies in the house, the Eskie tends to start to worry when the baby starts crying. They will worry until you let them know that there is nothing to be worried about. 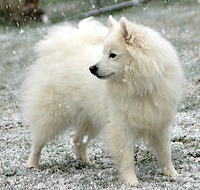 This is a unique characteristic of the American Eskimo Dog that could either be a good trait, or a bad trait, depending on your lifestyle and living conditions. Since the Eskie has a coarse double coat, they require a decent amount of grooming and brushing. 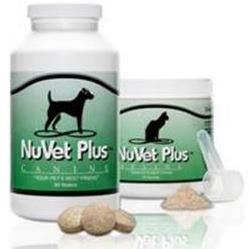 You can take one look at them, and know that they need special attention when it comes to their coat. Although they have a lot of hair, it’s easy to groom and brush and should be brushed at least twice a week, but daily when they are shedding. This breed is an average shedder, but they do not blow their coat. A good pin brush will work well with this type of coat. Along with the routine brushing, they need to have their eyes, ears, nails, and pads checked routinely also. Hair continues to grow between the paw pads, and this can be trimmed with a small pair of blunt-tipped scissors. This breed is prone to tear stains, which is when their tears gather under their eyes. This can be a breeding ground for bacteria and yeast though it is quite harmless. Try and keep this area clean to prevent discoloration. Bathing is usually manageable with this breed. Before bathing, be sure to brush out any tangles or mats that have developed. Use a good quality shampoo and conditioner. Either dry the coat naturally or use a hair dryer on the cool setting. If the hair dries naturally, you will need to brush it out again after it is dry. Here are a few grooming supplies you may want to check out. Click on the pictures to check out prices. This is a fairly healthy breed, but irresponsible breeding can cause hip and eye problems. If anything seems out of line, then contact your vet immediately just in case. Pay close attention to the tear stains and eyes. Some may be allergic to fleas, so that is also something to keep in mind. This is a breed that can tend to be overweight if not given proper exercise. Be careful not to overfeed your Eskie. Other than that, this is a very healthy breed, but consider the following health concerns. 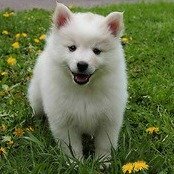 A well-written resource for anyone who is thinking about the breed or who already own an Eskie and would like to learn more about their dog. This book covers all aspects of owning an American Eskimo Dog including nutrition, health, training, grooming, and showing. 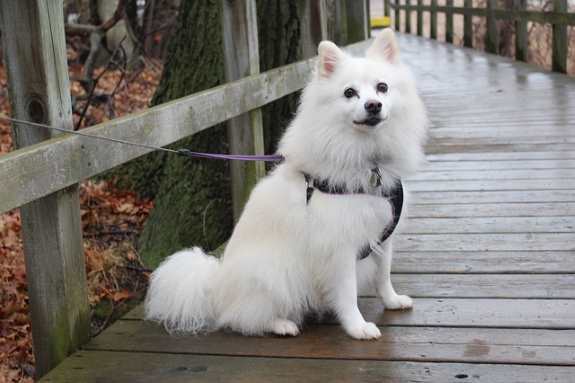 Everything you need to know to find, live with, love and care for an American Eskimo Dog. 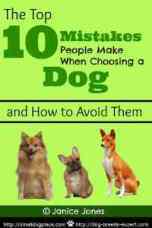 This book comes in both Kindle and print editions, and would make a great addition to your dog library. Please share your experience living with an American Eskimo Dog. Don't forget to add a picture or two.